Reprinted from old web site. A nice article by Jim Gerweck from April 2003. Titled “Getting Dirty: Leatherman’s Loop – the athletic equivalent of jazz”. Jim has run the race timing for the Leatherman’s Loop for many years. If, as Marty Liquori once opined, road racing is rock ’n’ roll and track and field is Carnegie Hall, then trail racing must be the athletic equivalent of jazz or blues: a somewhat esoteric, acquired taste enjoyed by a small handful of diehard afficionados. The fields of most trail races are numbered in the dozens; any that break into triple figures approach the status of mega-events. To be honest, most trail racers and trail race organizers probably prefer it that way—after all, John Coltrane never played Madison Square Garden. 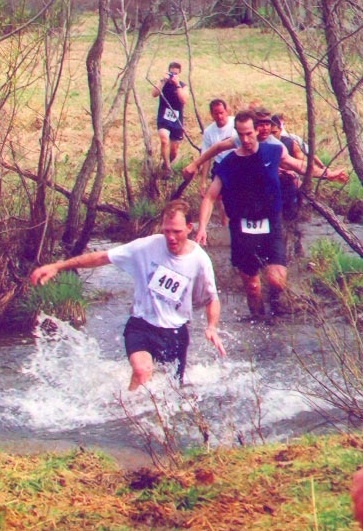 In this arcane world, the Leatherman’s Loop is a glaring exception, a trail racing Woodstock, and not just because most of the participants finish looking like they’ve survived the mud pits of Yasgur’s Farm. Held the last Sunday in April for the past 17 years, the Loop hit an even 800 finishers in 2003. “We always keep talking about what the limit is, but so far we haven’t reached it,” says co-organizer Tony Godino. While some of this multitude are hard-core trail junkies who use the Loop as a “sprint” respite from the longer Northeast trail running circuit events, the vast majority are roadies for whom it’s their only venture into natural surface racing. So why do hundreds of them, who blanch at the thought of running far tamer cross country races, sign up for 10 kilometers of swamps, streams, and sand hills? Such loyalty among Loop veterans is typical, as is their perseverance in the face of challenges not encountered in your typical race. Two years ago, 11-year-old Griffin Faro, whose nickname, perhaps ironically, is “Buck,” was knocked down by a deer a mile and a half into the race. He returned to finish the next two years. But it’s the course that draws so many of these runners off the roads and into the woods. There is no way to avoid getting wet, muddy, and covered with sand from a 75-foot near vertical climb halfway through, but that’s a major part of the attraction. “The worse the conditions, the more people seem to enjoy it,” says Goldblatt. “People are here for the camaraderie and shared experience,” says Godino. “They don’t come to run fast, they come to have fun.” And for close to two decades, the Leatherman’s Loop has been providing just that, by the muddy, wet bucket full. « How do you train for the Leatherman?